When I said that we'll be back to Kuala Lumpur (KL) soon, I had not expected it to be this soon! This time however, we'll be going together with my mum-in-law and youngest brother-in-law. We boarded the Grassland Express Super VIP Coach at Golden Mile Complex at 7.45am. She had a great time exploring the bus.. 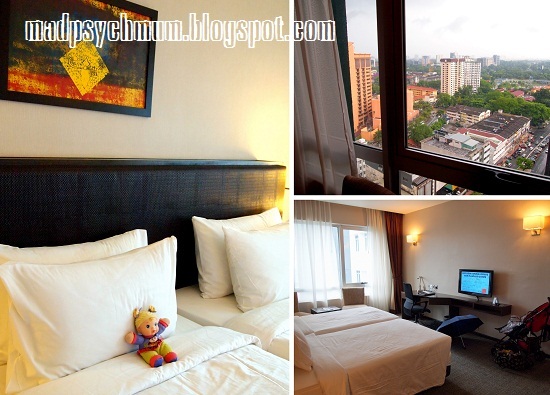 Unlike our previous trip where we stayed at Berjaya Times Square Hotel, we stayed at Furama Bukit Bintang hotel this time because they have large family rooms with four beds so that we could all bunk in together. 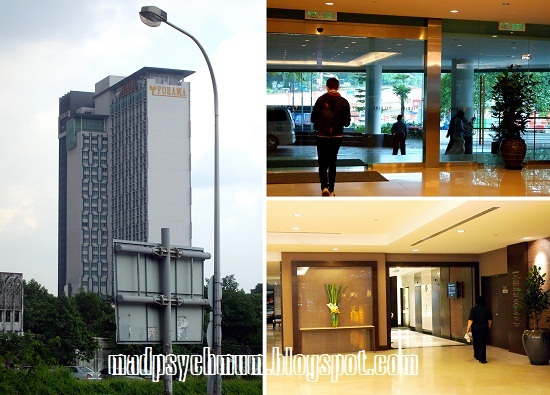 In order to get there, we'd have to walk along a short lane to our hotel located just behind Berjaya Times Square. However, as the lane is not covered and it started pouring with heavy rain suddenly, we had little choice but to brave the rain with just 2 umbrellas and a raincoat! Needless to say, we were quite wet by the time we reached the hotel and were so thankful to finally be able to get warm and dry. The family room that we booked was actually two rooms that were joined together by a common main door, corridor and living area. TV and the door leading into the common living area. There were a total of 4 super single beds, 3 TVs, 2 bathrooms and 2 mini bars! There's so much space for baby girl to run around and play hide-and-seek (albeit with no one in particular..). 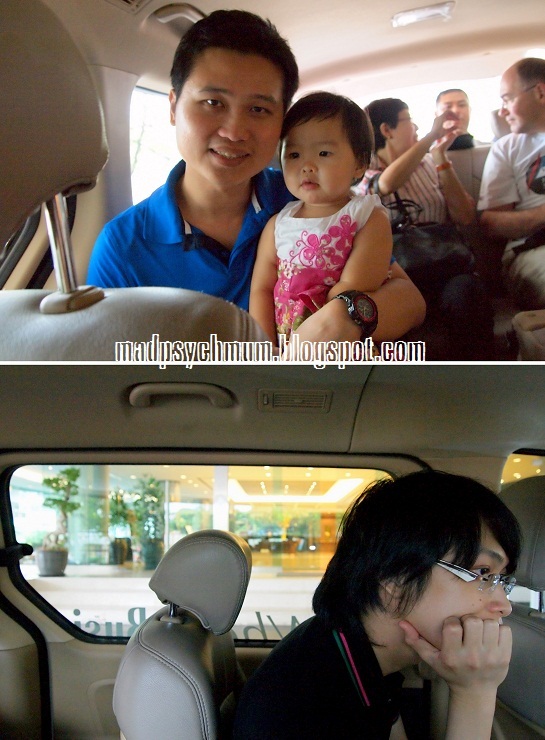 We couldn't spend too much time checking out our room as we had to catch the free shuttle service provided by the hotel for guests going to KLCC, Pavillion and Berjaya Times Square. However, they do not provide the return trip to the hotel so we would have to find our own way back by cab. Our driver was really nice and gave us tips on taking cabs as he was afraid that we might get cheated. According to him, blue MPV cabs are the way to go as they go by meter so it's much cheaper. If you really can't find a blue cab and are forced to take the regular ones where you need to negotiate a price, the reasonable amount from Pavillion and KLCC to Furama is RM8-10 and RM13-14 respectively. We decided to visit the Pavillion as it came highly recommended by some of the hubby's friend as well as my fellow mum blogger Ruth. 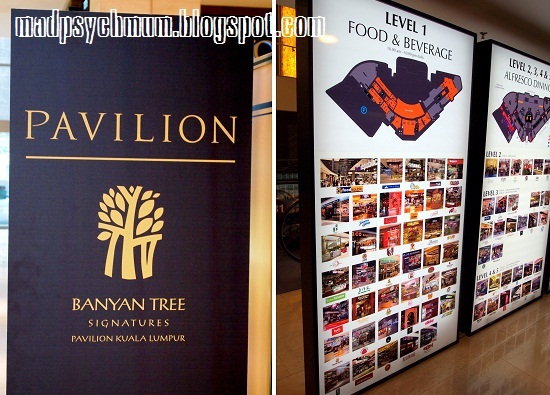 A nice directory that showed you all the restaurants and eatery with pictures! 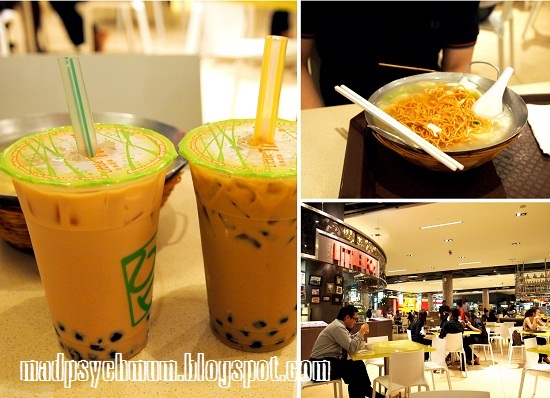 There were so many to choose from that we got a little dizzy and ended up eating at Food Republic, which is a common sight in Singapore. 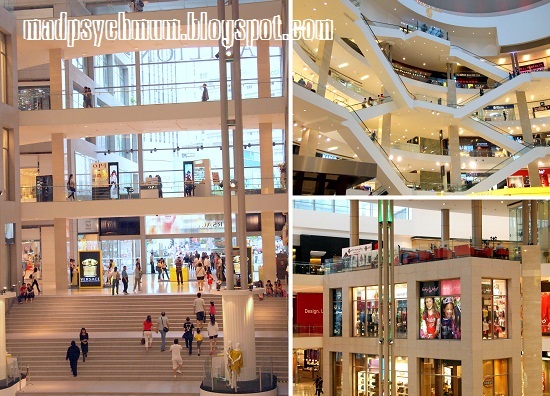 Come to think of it, you can find almost every other store in the Pavillion (such as Diaso and F21) in one of the malls in Singapore. so that she can point out the "Mei Mei" (little sister) in the window display -_-"
Since most of the stores can also be found in Singapore, we were kinda bored after a while to be honest so we decided to leave as it wasn't the kind of shopping experience that we were going for. 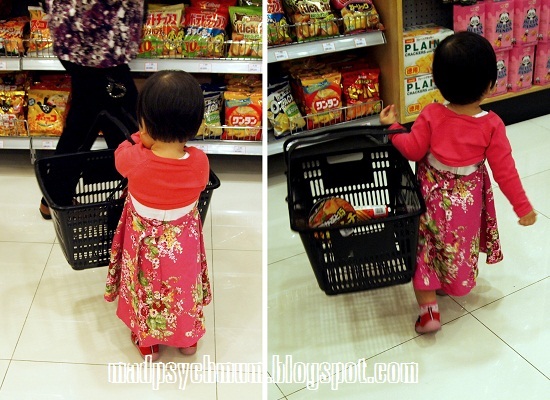 Baby Girl thoroughly enjoyed herself shopping around in Japanese Market though..
We tried to get a cab and the cabbies started charging us RM30 for one trip back to the hotel! Are they crazy? I told them straight out "no way, let's go somewhere else" and started walking away like we always do in Shenzhen (I learnt from the best: my daddy!) when we wanna force the seller to back down on their price. The hubby said RM20 and they said RM25 and I was like "NO FREAKING WAY!" They later agreed to RM20 but I will have nothing of it. I started walking away again and they finally said RM15. It was RM5 more than the usual RM10 but I finally gave in because it was more convenient than walking to who knows where to get a cab only to save a few bucks. He asked us if we wanted to buy some chocolates which was along the way but I firmly refused, saying that my daughter is tired and needed to sleep. He took us there anyway hoping to convince us to go but I shot back with a "I thought I told you I want to go straight back to the hotel?!" and he got unusually quiet after that. I didn't care since I paid more than what was reasonable so there was no reason why I should be made to feel bad about it! 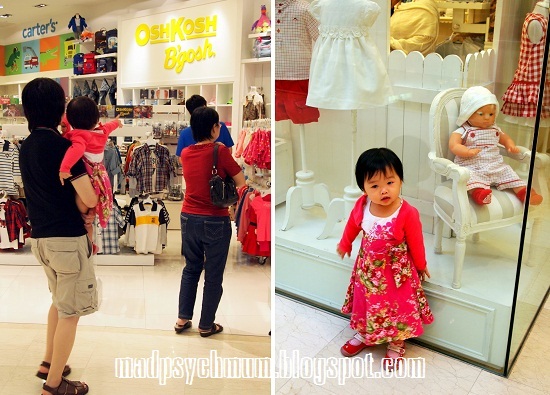 We decided to spend the rest of the day at Berjaya Times Square where we shopped till our feet ached and ate at my personal favorite restaurant, Kim Gary Restaurant.